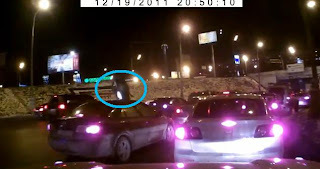 A driver in Russia caused a numerous-vehicle accident when his car slid off a parallel road near Lenin Avenue in Moscow. Local media report that the 24-year-old male driver lost control of his Renault due to adverse weather conditions and crashed into an oncoming Ford car, hurling the French car off an elevated ramp. Around six vehicles were involved, with the driver of the Renault suffering from minor injuries.